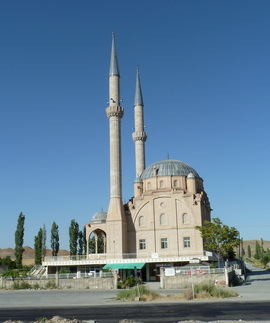 Home > Asia, Turkey	> In Aksaray –Thanks for the TV Cihan! 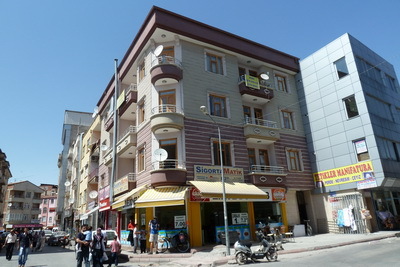 In Aksaray –Thanks for the TV Cihan! In the morning we carried on riding along the banks of the Tuz Gölü. 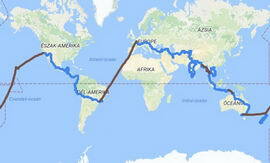 Our next stop was 20km on, where according to our custom we stopped at a petrol station to eat a 60Ft icecream. We were just about to leave when I discovered that they had free WiFi with net access there. I quickly went on line and happily spotted that Cihan from Aksaray responded on the Couchsurfing site and he was expecting us. 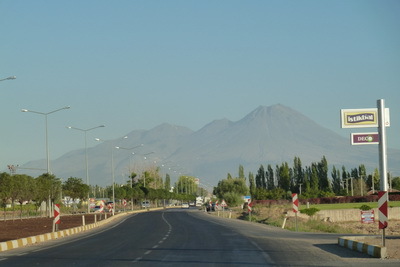 As we were nearing Aksaray, the outline of Hasan Dagi, the 3000+m high volcano, that dominates the background of the town, came into focus. 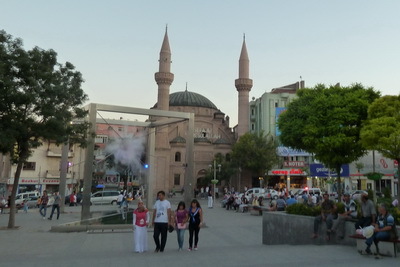 We easily rode into town, found the main square quickly with its mosque and Ata Türk sculpture. 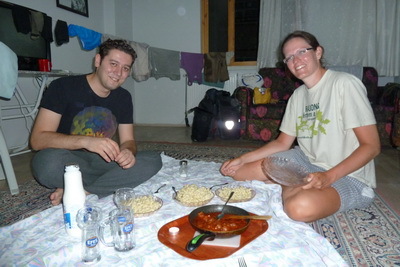 We were Cihan’s first Couchsurfing guests. We had a quick shower, followed by shoving a large amount of dirty stuff into the washing machine. For dinner we went out for a bottle of ayran and a portion of köfte, the latter we used for meat to go with the spaghetti. Dinner was extremely successful. Cihan did everything he could for his first guests. Even though we only asked for one night on the couch, he thought that we would be very tired, so he had a copy made of the flat key. As it happened, we didn’t manage to leave with him in the morning, although the night before we were planning an early departure, we overslept and were dreaming for most of the morning. So the spare key came in very handy. 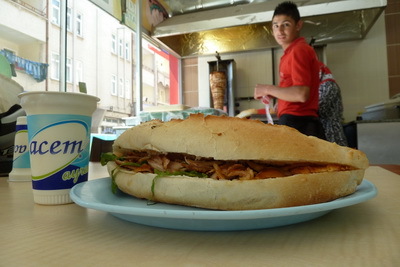 Giant chicken sandwhich with ayran – for 2TL (240Ft) one of our favourite foods! Ahogy haladok előre a töréneteitekben, úgy körvonalazódik bennem, hogy te Árpi, irgalmatlanul sóher egy ember lehetsz. Még ha az életben is… azt mondom, oké. De még itt is… az élménybeszámolóidban. Mindegy egyébként… de azért remélem, én értek félre valamit. Minden normális ember.odafigyel.arra, mi mennyibe kerül, még a hétköznapi életben is, hát még egy ilyen hosszú világkörüli túrán!